Communications Award – Publication – National Finalist. Schalau, J. W., Jones, C. K., & Gibson, R. D. (2016). Vertebrate Pests. In Arizona Master Gardener Manual (Revised) (p. 60). Tucson, AZ: UA CALS Press. Gibson, R. D., Jones, C. K., & Schalau, J. W. (2017). Vertebrate Pests. In Arizona Master Gardener Manual (Revised) (p. 60). Tucson, AZ: UA CALS Press. Jones, C. K., Carrie, D., & Dolores, G. (2016). Living with Wildfire: Homeowners’ Firewise Guide for Arizona (Revised). 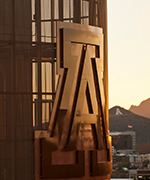 University of Arizona College of Agriculture and Life Sciences , 24. Jones, C. K. (2014). Fall Webworms in Arizona. UA CALS Cooperative Extension , 5. Jones, C. 2014. Fall Webworms in Arizona. University of Arizona College of Agriculture and Life Sciences. #AZ1627. 5 pp. Jones, C. K. (2014). Invasive, non-native thistles of Arizona. UA CALS Cooperative Extension , 11. Jones, C. 2014. Invasive, non-native thistles of Arizona. University of Arizona College of Agriculture and Life Sciences. #AZ1628. 11 pp. Jones, C. K., & Lenart, M. T. (2014). Forestry Professionals and Extension Educators vs. Climate Change: Climate change communication for Extension educators. Journal of Extension , 52(3), 14. Lenart, M. T., & Jones, C. K. (2014). Perceptions on climate change influence willingness to undertake forestry adaptation and mitigation. Journal of Forestry , 12(6), 11. Apel, M. B., Jones, C. K., & McDonald, D. A. (2013). The Accidental Sustainability Agent. Journal of Sustainability Education . Jones, C. K. (2013). Tent Caterpillars. Climate, Forests and Woodlands Community of Practice . Jones, C. K., & Kelly, J. (2013). Pines (Pinaceae) of Arizona. UA CALS Cooperative Extension , 48. Jones, C. and Kelly, J. (2013). Pines (Pinaceae) of Arizona. University of Arizona College of Agriculture and Life Sciences Cooperative Extension. AZ#1584. 48pp. Jones, C. (2012, Fall). Cooperative Extension Master Watershed Steward Program and Wetland Education Opportunities. In 9th INTECOL (International Association of Ecology) Wetlands Conference . Jones, C., & Lenart, M. (2012, Fall). Climate Change Adaptation and Mitigation: Management Perceptions of Forestry Professionals. In ANREP Biennial Conference . Jones, C., Crimmins, M., & Norland, E. (2012, Fall). The ANREP Climate Science Initiative: Creating Extension-wide Capacity to Respond to Climate Change. In ANREP Biennial Conference . Jones, C., & Lenart, M. (2011, Fall). Climate Change Adaptation and Mitigation: Management Perceptions of Forestry Professionals. In Society of American Foresters Annual Convention . Jones, C., Creighton, J., Crimmins, M., Kantor, S., Kruger, C., Schnepf, C., & Withrow-Robinson, B. (2011, Fall). Communicating Climate Change to Natural Resources and Agriculture Audiences and Stakeholders: The grass-roots, pro-active response of the US Cooperative Extension Service. In Fourth International Conference on Climate Change: Impacts and Responses . Jones, C., Creighton, J., Crimmins, M., Grotta, A., Hubbard, W., Norland, E., Sagor, E., Schnepf, C., & Taylor, E. (2010, Fall). Climate Science Initiative (CSI): New Resources for Extension Foresters and Educators. In Society of American Foresters National Convention . Apel, M. B., & Jones, C. K. (2018, August). International Assignments . University of Arizona Cooperative Extension Annual Conference. Oro Valley, AZ: UA Cooperative Extension. Jones, C. K. (2018, April). NDC Gardening Presentation . Community Workshop. San Carlos, AZ: Nalwoodi Denzhone Community. Jones, C. K. (2018, April). Plants and Landscaping for Wildfire . AZFAC Yarnell Firewise Seminar. Yarnell, AZ: Arizona Fire Adapted Communities Network. Jones, C. K. (2018, July). Plants and Landscaping for Wildfire . AZFAC White Mountains Firewise Seminar. Pinetop, AZ: Arizona Fire Adapted Communities Network. Jones, C. K. (2018, Mar 17). Intensive Gardening . Payson Community Gardening Series. Payson: Payson Community Garden. Jones, C. K. (2018, March). Pleasant Valley Hands-on Pruning Demonstration . Pruning Seminar. Young: UA Gila County Extension. Jones, C. K. (2018, May). The Role of Extension and the Modern Wildfire Situation . ANREP Biannual Conference. Biloxi, MS: Association of Natural Resources Extension Professionals. Jones, C. K. (2018, November). Fruit trees and care . High Country Garden Club Guest Speaker. Payson, AZ: High Country Garden Club. Jones, C. K. (2018, September). The Modern Wildfire Situation . Payson Stone Rock Club Guest Speaker. Payson, AZ: Payson Stone Rock Club. Jones, C. K., Barker, A., & McCombs, G. (2018, May 12). Organic Control for Insects & Diseases . Payson Community Gardening Series. Payson: Payson Community Garden. Jones, C. K. (2017, Mar 10 & Apr 14). Temperament and Leadership (Keirsey) Training . Ice House Canyon Schoolhouse Faculty In-service. Globe: Ice House Canyon Charter Schoolhouse. Jones, C. K. (2017, Mar 18). Intensive Gardening . PCG Gardening Series. Payson: Payson Community Garden. Jones, C. K. (2017, Mar 29). Plants for the Firewise Homes . Arizona WUI and Firewise Summit. Flagstaff: AZ Dept Forest & Fire Mgmt. Jones, C. K. (2017, May 18). Cooperative Extension Forestry Programs at Western Land Grant Universities . Western Forest Leadership Coalition Meeting. Flagstaff: Council of Western State Foresters. Jones, C. K., & Merk, P. A. (2017, August). Results-Based Accountability . Extension Annual Conference. Tucson, Arizona: University of Arizona Cooperative Extension. This session provides an introduction to Results-Based Accountability™ (RBA). This is a disciplined way of thinking and acting to improve entrenched and complex social problems. Communities use it to improve the lives of children, youth, families, adults. RBA is also used by organizations to improve the effectiveness of their programs and is based on Mark Friedman's work. Jones, C. K., Barker, A., & McCombs, G. (2017, Apr 22). Organic Control for Insects & Diseases . PCG Gardening Series. Payson: Payson Community Garden. Merk, P. A., & Jones, C. K. (2017, Aug 3). Introduction to Results-based Accountability . CALS Staff & Faculty Conference. Tucson: CALS Extension. Apel, M. B., Apel, M. B., Apel, M. B., Jones, C. K., Jones, C. K., Jones, C. K., Brain, R., Brain, R., Brain, R., Romich, E., Romich, E., Romich, E., Elliott, C., Elliott, C., & Elliott, C. (2016, June). Bridging the Initiatives – Energy, Climate Science and Sustainability . NACDEP/ANREP Joint Conference. Burlington, VT.
Jones, C. K. (2016, April). Climate Change Communication and the Comfort Zone . National Extension Sustainability Summit. Portland, OR: NNSLE. Jones, C. K. (2016, Feb). “Git-r-Done:” Harnessing Personal Energy - The Physical Energy Quadrant. . Joint Council of Extension Professionals Leadership Conference. Las Vegas, NV. Lachapelle, P., Jones, C. K., Brain, R., Christensen, B., & Wise, G. (2016, 06/28/2016). Coordinating Extension Climate Education: A "Round-Panel" Discussion on Integrating ANREP and NACDEP Programs . NACDEP/ANREP Professional Development Conference. Burlington, VT.
Jones, C. K. (2015, April). Communicating Climate Change Adaptation and Mitigation Practices through Extension. . National Extension Energy Summit. Seattle, WA. Jones, C. K. (2015, Dec). Climate Change Education in the Cooperative Extension System . Western Extension Climate Science Conference. Bozeman, MT. Jones, C. K. (2015, Feb). How to “Git-r-Done:” A workshop-styled overview of energy management skills. . Joint Council of Extension Professionals Leadership Conference. Jones, C. K. (2015, March). Invasive Species and Wildfire Hazards: Weeds and Wildfire . Extension Wildfire Workshop. Tucson, AZ. Jones, C. K. (2015, Nov). Climate Change Communication and the Comfort Zone . National Extension Sustainability Summit. Jones, C. K., Apel, M. B., Apel, M. B., & Jones, C. K. (2015, April). Talking Climate: A Roundtable Conversation on How Extension Educators Can Engage Audiences on Climate Change Issues and Adaptation and Mitigation Practices . National Extension Energy Summit. Seattle, WA. Jones, C.K.& M.B. Apel. 2015. Talking Climate: A Roundtable Conversation on How Extension Educators Can Engage Audiences on Climate Change Issues and Adaptation and Mitigation Practices. Proceedings of the National Extension Energy Summit. Seattle, WA. (60%). National (Roundtable); alsoJones, C.K., Powers, C., Edwards, L., & Stowell, R. 2015. Roundtable Conversation on How Extension Educators Can Engage Agriculture Audiences on Climate Change Issues. Proceedings of the National Association of County Agriculture Association AM/PIC. Souix Falls, SD. (60%). 7/15/15. National (Roundtable). Jones, C. K. (2013, 09). The ANREP Climate Science Initiative: Building Successful Collaborations . JCEP Galaxy IV Conference. Pittsburgh: PA.
Jones, C. K., Apel, M. B., Blodnik, M., Brain, R., Elliott, C., McDonnell, J., & Schmitt, B. (2013, 09). Communicating Climate and Sustainability Issues through Extension Programming . JCEP Galaxy IV Conference. Pittsburgh, PA: Association of Natural Resources Extension Professionals. Jones, C. (2012, June). Cooperative Extension Master Watershed Steward Program and Wetland Education Opportunities . Proceedings of the 9th INTECOL (International Association of Ecology) Wetlands Conference. Orlando, FL. Jones, C. K. (2012, May). Climate Change Adaptation and Mitigation: Management Perceptions of Forestry Professionals . ANREP Biennial Conference. Hendersonville, NC. Jones, C. K. (2012, May). The ANREP Climate Science Initiative: Creating Extension-wide Capacity to Respond to Climate Change . Roundtable Discussion at the ANREP Biennial Conference. Hendersonville, NC. Jones, C. K. (2012, September). Climate Science Initiative (CSI): New Resources for Extension Foresters and Educators . Society of American Foresters National Convention. Spokane, WA. Jones, C., Creighton, J., Crimmins, M., Kantor, S., Kruger, C., Schnepf, C., & Withrow-Robinson, B. (2012, July). Communicating Climate Change to Natural Resources and Agriculture Audiences and Stakeholders: The grassroots, proactive response of the US Cooperative Extension Service . Fourth International Conference on Climate Change: Impacts and Responses. Seattle, WA. Jones, C., & Lenart, M. (2011, November). Climate Change Adaptation and Mitigation: Management Perceptions of Forestry Professionals . Society of American Foresters Annual Convention. Honolulu, HI. Jones, C., Crimmins, M., & Twery, M. (2011, March). Climate Change and Managing Forests: New Models and Tools Webinar . Southern Regional Extension Forestry Webinar Series. Jones, C. K. (2018, August 7). Meeting Multiple Extension Objectives Through Community Partnerships . Faculty Conference. Tucson: University of Arizona Agriculture, Life and Veterinary Sciences, and Cooperative Extension. Jones, C. K. (2018, Nov). Be Ember Aware Interpretative Sign (revised 2018). . Payson Library. Payson: UA Gila County Cooperative Extension. Designed, revised and updated "Be Ember Aware" wildfire mitigation list (UN-Reno; E. Smith) for an interpretive 3'x5' outdoor display for use in Arizona. Jones, C. K. (2017, July 11). Meeting Multiple Extension Objectives Through Community Partnerships . NACAA Annual Meeting & Professional Development. Salt Lake City: National Association of County Agriculture Agents. Jones, C. K., Elliott, C. A., & Romich, E. S. (2016, June). National Grassroots Extension Initiatives: Making the Connection. . NACDEP/ANREP Joint Professional Development Conference. Burlington, VT.
Jones, C. K. (2015, April). Making the Energy Connection: National Grassroots Extension Initiatives on Sustainable Living Education and Climate Science. . National Extension Energy Summit. Seattle, WA. Jones, C. K. (2015, August). Fulbright Opportunities for Extension Educators . 2015 Arizona Cooperative Extension Conference. Tucson, AZ. Jones, C. 2015. Fulbright Opportunities for Extension Educators. Proceedings of the 2015 Arizona Cooperative Extension Conference. Tucson, AZ. 8/4/15 (Poster and Presentation). Apostol, K. G., McAvoy, D., Rappold, P., & Kuhns, M. (2017. Biochar in the Intermountain West(p. 11). Jones, C. K. (2013, 09). The ANREP Climate Science Initiative: Building Successful Collaborations. Proceedings of the JCEP Galaxy IV Conference. Jones, C. K., Apel, M. B., Blodnik, M., Brain, R., Elliott, C., McDonnell, J., & Schmitt, B. (2013, 09). Communicating Climate and Sustainability Issues through Extension Programming. Proceedings of the JCEP Galaxy IV Conference. Gottschalk, L., Ziesing, R., & Jones, C. (2011, Fall). Gila County Master Gardener Association Quarterly Newsletter. Gila County Cooperative Extension.